Not too long ago I was working on a silk floral piece for client when the foam based I had fitted to the container split, causing the last hour of work to be for essentially nothing. I was frustrated, because the base broke, though really because I was not happy with the way everything was shaping up. The balance was off; it didn’t seem to have the correct proportions coupled with the fact that some of the colors were not working the way I thought they should. I just walked away from it hoping fresh eyes would ease the dissatisfaction. The next day I took everything apart, rebuilt the foam base and noticed as I regrouped the parts they looked better grouped by their hues instead of balancing them with differing colors. In the end, it came out much better than the broken mess I was almost in tears over the previous day. I just looked at what I had, only to figure out the way it should have been all long. 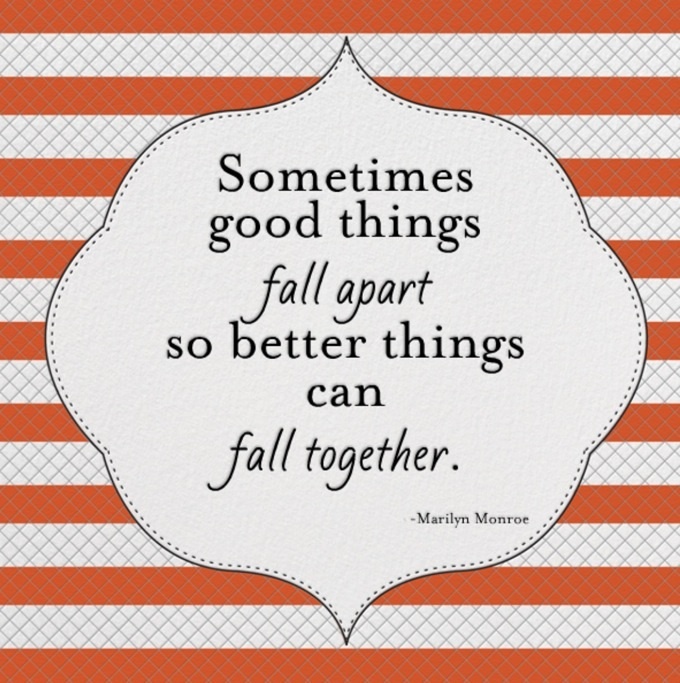 Marilyn Monroe was right; sometimes it just purely has to fall apart for it to fall together better.